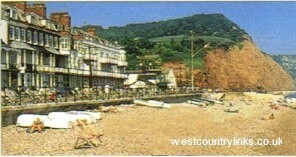 Sidmouth Hotels, Cottages, Holiday Parks, Camping and self-catering, Devon. Sidmouth stands in the valley of the River Sid, at the foot of sandstone cliffs. With it's air of charm and tranquillity, and mild climate it attracts many visitors. Sidmouth is an attractive seaside resort full of Regency and early Victorian buildings. For fine views climb Salcombe Hill Cliff.